Jurnal Vokasi Keperawatan ini memuat publikasi hasil penelitian dosen dan mahasiswa yang berkaitan dengan ilmu keperawatan dan kesehatan. Bidang ilmu keperawatan meliputi: Keperawatan Medikal Bedah, Keperawatan Maternitas, Keperawatan Anak, Keperawatan Jiwa, Keperawatan Keluarga, Keperawatan Gerontik, Manajemen Keperawatan dan Bidang Ilmu Kesehatan lainnya. Pseudocode is a scientific journal in the information science family that contains the results of informatics research, scientific literature on informatics, and reviews of the development of theories, methods, and application of informatics engineering science. 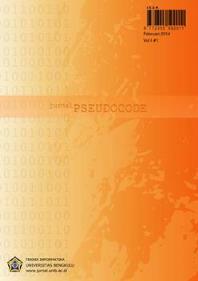 Pseudocode is published by the Informatics Study Program, Faculty of Engineering, University of Bengkulu. Editors invite researchers, practitioners, and students to submit article manuscripts in the field of informatics engineering. Pseudocode is published 2 (two) times a year in February and September. 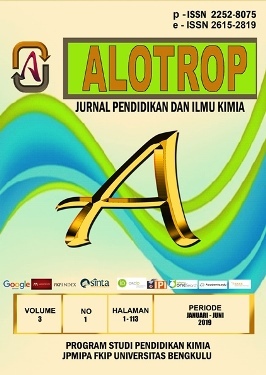 Welcome to the Journal Alotrop, is an Open-Acces and peer-reviewed journal aims to publish scientific articles related to chemistry and education :i.e an interaction between natural sciences, educational sciences, technologies and management for both education and sciences and wise use of resources. We particularly encourage manuscripts that discuss contemporary research that can be used directly or inderecly in adressing critical issues and sharing of advanced knowledge and best practices in chemistry and education. 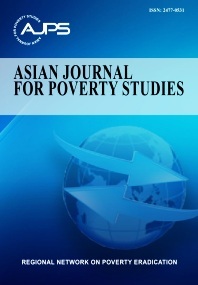 Asian Journal for Poverty Studies (AJPS) is a peer-reviewed international journal publishing research articles on poverty studies including, but not limited to, urban and rural poverties, gender studies on poverties, public policies on poverties, community empowerment, and technology for poverty alleviation. AJPS is published twice a year, in June and December, both online and printed versions. Jurnal Sain Peternakan Indonesia (JSPI) pISSN 1978 - 3000 and eISSN 2528 - 7109 is the official scientific magazine issued by the Department of Animal Husbandry of the Faculty of Agriculture of Bengkulu University, as its contribution to the development of Animal Science published in Bahasa Indonesia and English which contains the results of research, / literature review, field case or idea in the field of animal husbandry. JSPI first published in 2006 as much as 2 times in one year ie January-June and July-December edition. In 2017, JSPI began to publish 4 articles in one volume a year in March, June, September, and December. Special editions in English can be published if necessary. Editorial received a paper in the field of animal husbandry that has not been published. 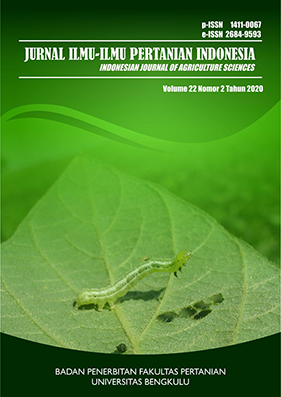 AGRISEP Journal is a scientific communication media which is issued by Agribusiness Study Program of Agricultural Socio-Economics Faculty of Agriculture, the University of Bengkulu in collaborations with Perhimpunan Ekonomi Pertanian Indonesia (PERHEPI) and Associations Agribisnis Indonesia (AAI). It's the contribution to the development of social science and agricultural economy in agribusiness field which is divided into Bahasa Indonesia and English which contains research results, literature review, field cases or concepts in the socio-economic field of agriculture. Journal AGRISEP p-ISSN 1412 - 8837 (Printed) and e-ISSN 2579-9959 (online) in a year published twice (March and September). Special editions in English can be issued required. The Agrisep journal fits well for researchers and academics who are inheriting the results of research, scientific thought, and other original scientific ideas. Journal AGRISEP publishes research papers, technical papers, conceptual papers, and case study reports. The article translated in the Journal of Agrisep is the original author's work with broad topics covering agricultural economics, agribusiness management, rural sociology, agrarian studies, regional development, politics and agricultural policy, natural resource and environmental management, and agricultural/rural counselling and communication. Based on the Decree of the General Director of Strengthening the Research, Technology and Higher Education of the Republic of Indonesia No. 34/E/KPT/2018, Jurnal AGRISEP: Kajian Masalah Sosial Ekonomi Pertanian dan Agribisnis was designated as an Accredited Scientific Journal with the category "SINTA 3" from July 09, 2018 and then submit again re-Accredited 05 October 2018 was designated as an Accredited Scientific Journal with then category "SINTA 3' from December 2018 - July 09, 2023. Since 2014, Open Journal Systems (OJS) has been applied to all business process in Jurnal AGRISEP. Therefore, the authors are required to register in advance and upload the manuscript online. The process of the manuscript could be monitored through OJS. Authors, readers, editorial board, editors, and peer review could obtain the real-time status of the manuscript. A hard copy of the journal could be purchased by the system. Several other changes are informed in the Journal History. 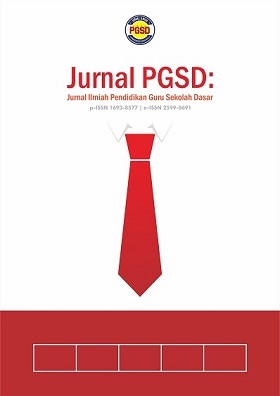 PGSD Scientific Journalspublished by PGSD Study Program FKIP University of Bengkulu. The article published is an article of research of the last three years related to learning in PGSD or related to the development of learning models, improving teacher competence and classroom management in elementary schools that have not been published in other print media. 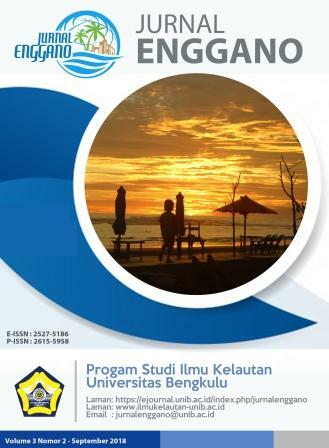 Jurnal Enggano is published twice a year, in April and September, and contains a mixture of academic articles and reviews on all aspects of marine science and fisheries. Articles in the journal may be downloaded, reproduced and redistributed without permission for non-commercial purposes as long as the author and source are properly cited. TRIADIK is a high quality open access peer reviewed research journal that is published by FKIP University of Bengkulu. It is providing a platform for the researchers, academicians, professional, practitioners and students to impart and share knowledge in the form of high quality empirical and theoretical research papers, case studies, literature reviews and book reviews on education. 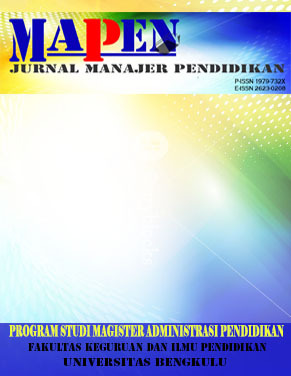 Jurnal Ilmiah Manajer Pendidikan was first published in April 2007 by the Master's Degree Program in Post-Graduate Education Management of Bengkulu University. Currently published three times a year, in April, Agustus and Desember. The editor receives scientific papers written in accordance with the article writing instructions as attached to the back page. 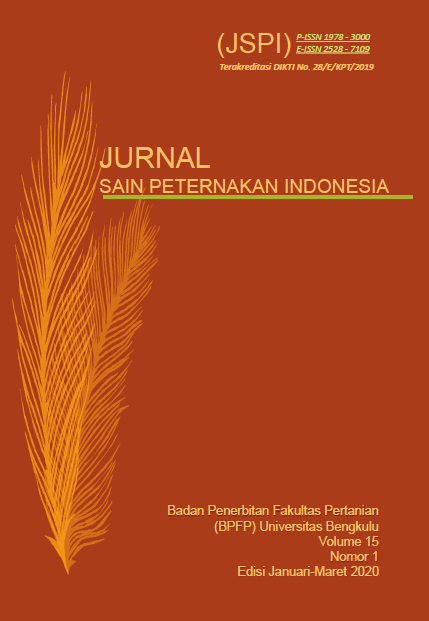 Jurnal Ilmu-Ilmu Pertanian Indonesia (JIPI) is a scientific journal that publishes research results related to resource issues and agricultural productivity widely, including Agroecotechnology, Plant Breeding, Soil Science, Plant Protection, and Agricultural Ecology. The editor receives a manuscript in Indonesian or English complete with abstracts in the two languages and is typed in a word processing program that is compatible with Microsoft Word. The manuscript must be original and has never been published or in the publishing process in any media. The author is responsible for the contents of the manuscript published in this journal. The feasibility of publishing a script is determined by the editorial board after obtaining a recommendation from the best partner appointed by the editorial board. Jurnal Ilmu-Ilmu Pertanian Indonesia (JIPI) is managed according to OJS rules. Publish twice a year, namely June and December. 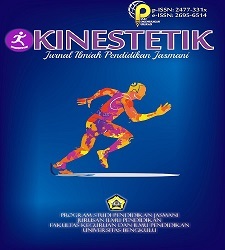 Kinestetik merupakan Jurnal Ilmiah Pendidikan Jasmani yang diterbitkan oleh Program Studi Pendidikan Jasmani JIP FKIP Universitas Bengkulu. Jurnal ini mempublikasikan artikel-artikel yang berisi hasil Penelitian, Pendidikan dan Pengajaran dibidang Pendidikan Jasmani. 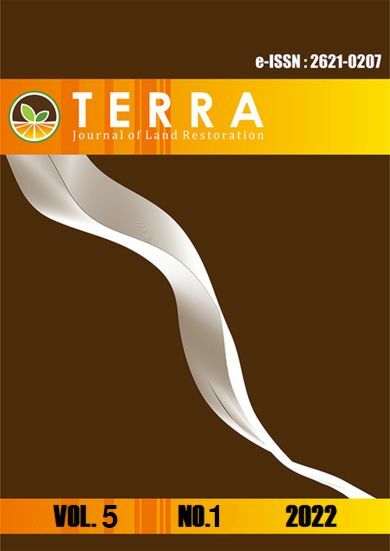 TERRA is an interdiciplinary peer reviewed journal committed for an exchange of the original research findings in soil science, plant science, and forest science for land restoration. The journal invites contributions on topics in soil science as natural body and its function in land ecosystem, natural and human-enhanced processes leading to soil degradation, and ranges of land restoration efforts. PENDIPA Journal of Science Education is a peer-reviewed, open-access journal covered all aspect of science and science education. 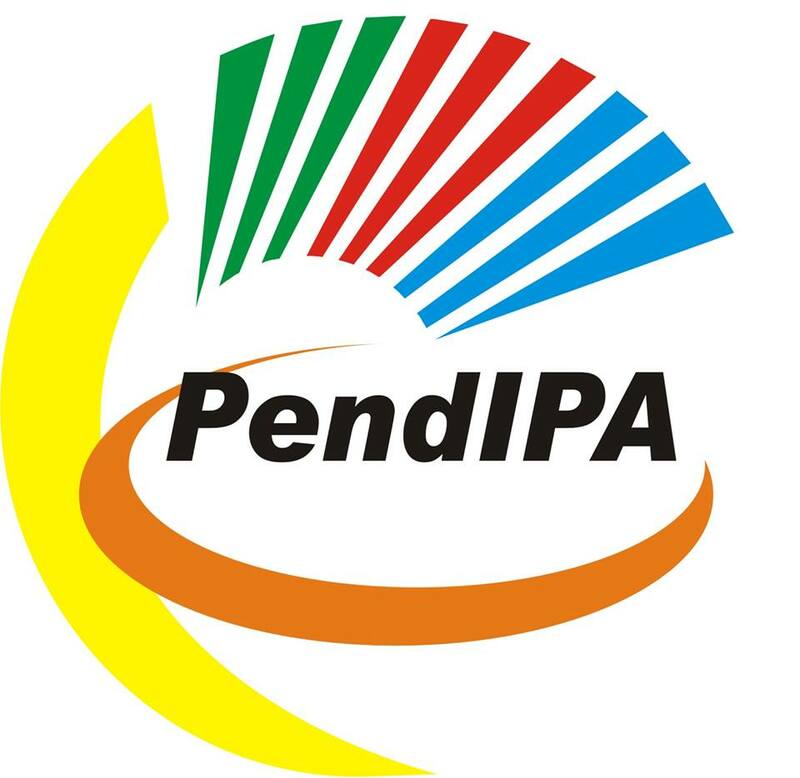 PENDIPA journal welcomes the submission of scientific articles related to mathematics, physics, chemistry, biology, and its implementation in a school, higher education and other educational institution. We encourage scientist, lecturer, teacher and student to submit their original paper to the journal. 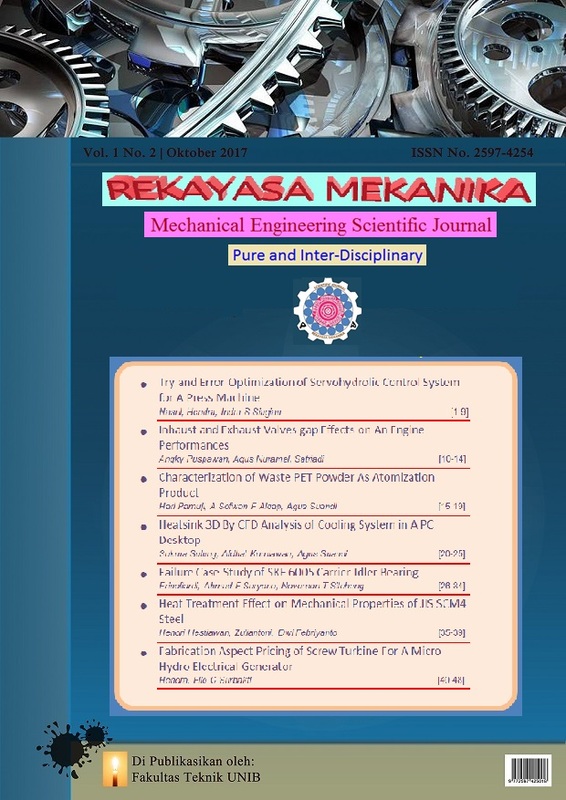 PENDIPA journal is published by Graduate School of Science Education - University of Bengkulu, three times a year on February, June and October. 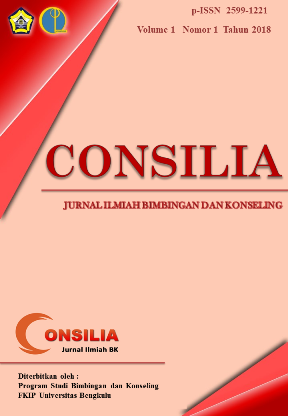 CONSILIA is a journal published by the Guidance and Counseling Program of FKIP University of Bengkulu. Consilia is published three times a year in January, May, and November. Consilia is available in printed-out and electronic version, with ISSN 2620-5343 (online) and ISSN 2599-1221(print). berISSN 2598-9669, merupakan jurnal yang mempublikasikan hasil penelitian di bidang pendidikan dan pembelajaran biologi baik pada jenjang sekolah menengah maupun perguruan tinggi. JURIDIKDAS (Jurnal Riset Pendidikan Dasar) diterbitkan oleh Prodi PGSD FKIP Universitas Bengkulu. Artikel yang diterbitkan merupakan artikel hasil penelitian tentang pendidikan dasar di Indonesia, yang berkaitan dengan proses pembelajaran di SD, pengelolaan pendidikan dasar, maupun prosess penyiapan dan pengembangan guru SD profesional yang belum pernah dipublikasi pada media cetak lainnya. 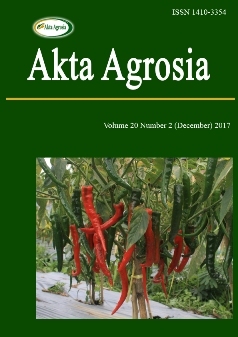 AGRITROPICA is an international, double-blind peer-reviewed, open-access journal, published by Badan Penerbitan Fakultas Pertanian (BPFP), Fakultas Pertanian Universitas Bengkulu (Publishing House of Faculty of Agriculture, University of Bengkulu). International Standard Serial Number AGRITROPICA : 2621-217X (Print) and 2621-699X (Media Online). It will consider submissions from all over the world, on research works not being published or submitted for publication towards publication as the full paper, review article and research note in all areas of tropical agricultural sciences. AGRITROPICA includes a wide range of tropical agricultural fields and disciplines to create a platform for the authors to make their contribution towards the journal and the editorial office promises a peer review process for the submitted manuscripts for the quality of publishing. The scopes of the journal include, but are not limited to, the following fields: Agribusiness, Agroindustry, Crop Sciences, Forestry and Environmental Sciences, Animal Husbandry, and Marine Sciences. The journal is published in both print and online versions, and the online version is available for free. Jurnal Pendidikan Matematika Raflesia telah menjadi P-ISSN: 2548-4435 (media cetak) dan E-ISSN: 2615-8752 (media online) yang diterbitkan oleh Program Studi Pendidikan Matematika dari Fakultas Pendidikan Guru Pelatihan Pendidikan Universitas Bengkulu, yang merupakan berisi artikel tentang hasil penelitian, ulasan / tinjauan literatur, kasus lapangan atau ide dalam program matematika dan Pendidikan Matematika. Editor menerima artikel dalam program matematika dan pendidikan matematika yang belum pernah dipublikasikan.